With gas prices climbing toward $4.00 per gallon, the push to save money at the pump is more urgent than ever. In recent years, the Toyota Camry and Highlander, Ford Escape and Fusion and even the Honda Civic have all dipped their toes into the hybrid pool, but the true king of MPGs among hybrids remains the Toyota Prius. The 2011 and 2012 Prius’ have been known to reach fuel efficiency as high as 70 MPG. The Prius employs Toyota’s patented Hybrid Synergy Drive technology which uses your forward energy when coasting and the vehicle’s natural kinetic energy under braking to charge a battery powered motor that takes over in low power situations. When properly utilized, this balance of gas and electric gives the gas engine a break and considerably increases your fuel efficiency. The 2012 Prius model line kicks fuel efficiency into overdrive with the advent of the new Prius Plug-in. The Prius Plug-in is set to debut in March 2012 in 15 states, including Vermont. It employs dedicated electric driving capability, allowing speeds up to 62 MPH for up to 11 miles. That means that with short distance driving and sufficient charging access, it is possible to operate on purely electric power and not burn a single drop of gas. And when you do go on longer trips where you’ll run out of electric power, the plug-in Prius switches seamlessly to hybrid power, giving you the same excellent gas mileage you’d expect from a Prius. For a look at what makes the Prius unique, check out the video below, and then come in and check out our full selection of 2011 and 2012 Prius models for yourself! ToyotaCare, Toyota’s complimentary maintenance plan, is often the source of questions by new car buyers in our showroom. Complimentary maintenance plans are becoming the norm for many auto manufacturers. They allow you to have your regular maintenance like oil changes, tire rotations, and multi-point inspections (not to be confused with state inspections) performed at a dealership at no cost to you. ToyotaCare offers new Toyota owners 2 years or 25,000 miles (whichever comes first) of complimentary regular maintenance performed by the H-Team. This includes regular oil and filter changes, tire rotations and a 19-point inspection. To find out what is included in Toyota’s 19-point multi-point inspection, visit the H-Team’s ToyotaCare page here. ToyotaCare is more than just regular maintenance; it also includes 24-hour roadside assistance for the same 2 years or 25,000 miles. This roadside assistance plan covers you for those unexpected days when you need a hand: If you’ve locked your keys in your car, have a flat tire, need a jump-start, or even a tow. Now that you’re equipped with a little extra knowledge, choosing your new Toyota will be that much easier. If you have any other questions about ToyotaCare, don’t hesitate to contact a member of our sales or service staff. On February 9, With the signing of the I Am Vermont Strong license plate bill, Governor Shumlin gave his official authorization to purchase a Vermont Strong license plate and affix it to the front of your vehicle. To show our support for the recovery efforts, the H-Team has purchased 100 Vermont Strong plates. Five of these plates will be given away via social media, each of the remaining 95 will be included with your purchase of a new or used vehicle at Heritage Ford, Toyota and Scion. If you’re not in the market for a new vehicle, but still want to contribute to the cause, you can help too. 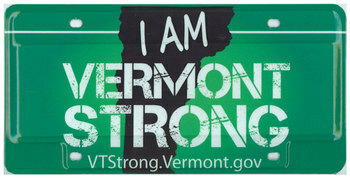 For a $25 donation to the fund, you can get your own I Am Vermont Strong license plate today by visiting the official Vermont Strong website, here. The H-Team’s support of the recovery efforts goes beyond just license plates, and if you wish to support the cause and a license plate isn’t for you, there’s more you can do too. Visit RebuildWaterbury.org and learn about what’s being done to breathe life back into Waterbury and the surrounding communities affected by the hurricane, and make a donation to do your part to help. The H-Team will match your donation up to $10,000. Two weekends ago, during Super Bowl XLVI, Chrysler took a stab at Ford’s F-150 in their commercial, 2012. There has been some chatter as to whether or not Ford should retaliate with its own commercial, proving that the F-150 is the superior truck. Ford doesn’t have to produce a commercial to prove this, the numbers don’t lie. You can’t sell 35 million units of an inferior product. You don’t win Motor Trend’s Truck of the Year four times and not be recognized. And apparently, you don’t get to be the best selling pick-up truck of all time without making a few enemies along the way. Still not convinced? Take a look at a comparison between a 2012 Ford F-150, 2012 Chevrolet Silverado, 2012 Dodge Ram, and a 2012 Toyota Tundra, here. Convinced? Take a look at our F-150 inventory, here. Friday evening, the H-Team and Rusty Dewees welcomed about 50 local community members to the Majestic 10 Theater for a special public preview of the SB Remembers Documentary. The documentary highlights the planning and construction of the new South Burlington Veterans Memorial to be erected at Dorset Park. The documentary was locally promoted on Sunday through a Super Bowl commercial, seen below. The event was a resounding success, with Rusty Dewees and the H-Team’s own Toby Tyler chipping in to help raise $1,000 in a silent auction. The weekend also saw the official launch of the newly developed SBRemembers.org, where visitors can learn about the memorial and see artist’s renderings of the proposed final product. Since its launch on Sunday, the site has already generated $500 in donations to the memorial project. The Veterans memorial wasn’t the only worthy cause to have received special attention from the H-Team this past weekend. A group of courageous H-Team members braved the frigid waters of Lake Champlain on Saturday morning as part of the annual Penguin Plunge, helping to raise money for the Special Olympics Vermont. The Antifreezers were among the first to race into (and out of) the lake, donating over $1,800 to the charity, which raised over $300,000 for the Special Olympics of Vermont. Click here to see video of the Plunge participants, and look for the Antifreezers around 3:30. This Friday, February 3, join the H-Team and Rusty Dewees at “Night at the Majestic 10” at the Majestic 10 Theater in Williston for a free public preview of the SB Remembers Documentary, sponsored by Heritage Automotive. The documentary highlights the planning process of the upcoming South Burlington Veterans Memorial atDorsetPark, and its importance to the community as a whole. Screenings of the documentary will take place at 6:00pm and 6:30pm, with a silent auction featuring items donated by local businesses taking place from 6:30-7:30pm. Complimentary hor d’oeurves and a cash bar will be available atOscarsBarat the Majestic 10, and attendees will be able to meet the local artists who helped create the memorial design. SBRemembers.org, a website dedicated to the planning and construction of the new South Burlington Veterans Memorial will be launched later this month.